Mitelli’s designs are to a high standard of artistic quality and a departure from the old tradition, especially the 22 Trumps. The title refers to “a new form of Tarocchini” so maybe Mitelli wanted to express his own interpretation of the Trump cards. There are four court cards, plus aces and numerals six to ten in each suit making a total of 62 cards, a number suited to the game the deck was intended for. The coins have little portraits inside them. The Ace of Cups has the arms of the Bentivoglio family for whom the cards were made. The Ace of Coins has a portrait medallion with the artist’s name. 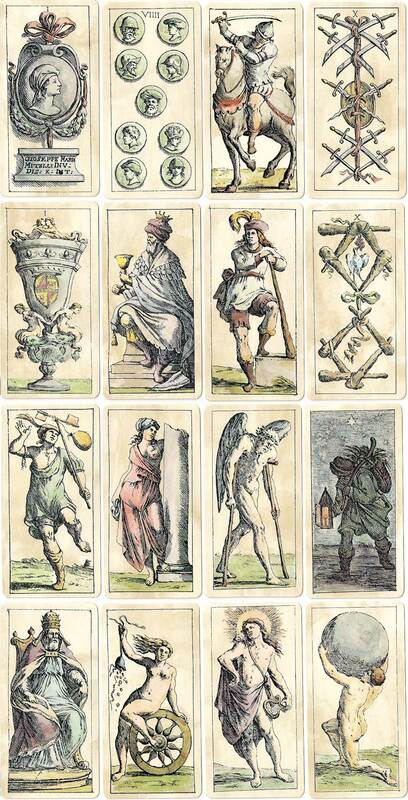 Above: Tarocchini di Bologna by Guiseppe Maria Mitelli, hand-coloured etchings, 1664. Facsimile edition by Graffica Gutenberg, 1978. Cards from the collection of Rod Starling. 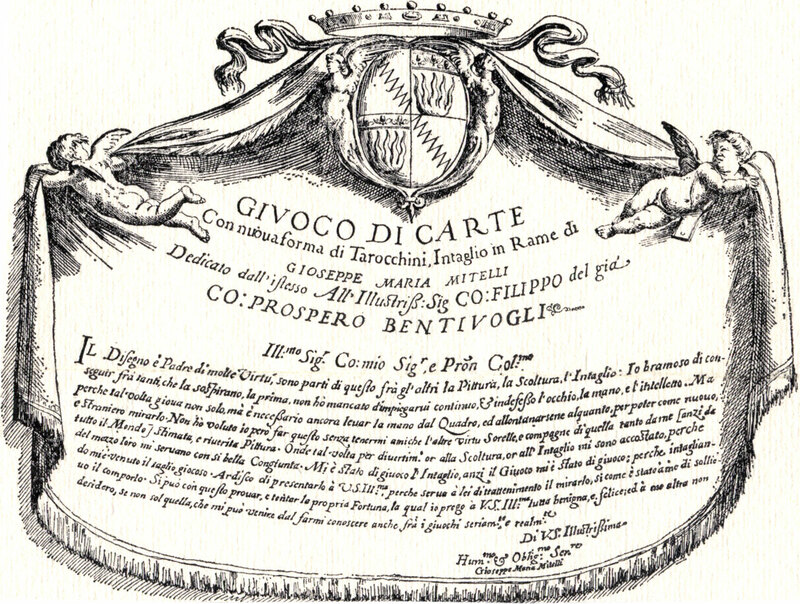 Above: the cards were also published as uncoloured prints in book form with the title “Giuoco di carte, con nuova forma di Tarocchini, intaglio in Roma di Guiseppe Maria Mitelli...”. The Ace of Coins has a portrait medallion with the artist’s name. Mitelli’s fanciful designs are a break from the earlier hand-painted tarocchi cards produced in Italy, but there are several instances where the decorative designs on the numeral cards and some of the Trumps remind us of other, earlier, packs of tarocchi or ordinary playing cards. The Trumps are unnamed and unnumbered. However, the four 'Popes' are numbered by hand: 1: 2: 3: 4: as part of the reproduction, so were presumably handwritten on the originals. Adam West-Watson wrote: "One can only assume the numbers were put on so as to determine who won the hand when two Popes were played to the same trick. And I guess, in true archivist style, Vito left the numbers on to make a very genuine facsimile of what must be an extraordinarily rare deck." Cards from the facsimile edition published by Vito Arienti, Edizioni del Solleone, in 1977.